Blade height (at heel): 1.85 in. Description: Bill Burke, who was honored as a Master Smith June 2008, is best known for creating some of the best hunting knives that can be found anywhere. 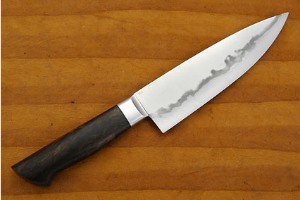 Over the last few years, he also put his attention to creating a small number of chef's knives. The results are exceptional. The European Chef's knife (known as a gyuto in Japan) is well suited for use as a general purpose chef's knife -- from chopping, to slicing and dicing -- from fruits to vegetables and meats, the chef's knife is a great choice. The long blade is needed for the sawing motion required to cut meat and vegetables and the slim profile keeps the weight low and the balance right. The blade was hand forged in a technique known as hon warikomi. 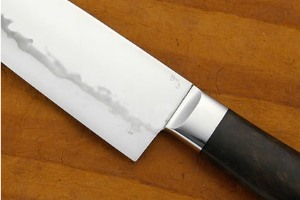 This modification of san mai (three layers) forges stainless steel to the sides of a carbon steel blade. The result is the exceptional edge holding of carbon steel with significantly easier care. The transition line between stainless steel and carbon steel is exceptionally dramatic. 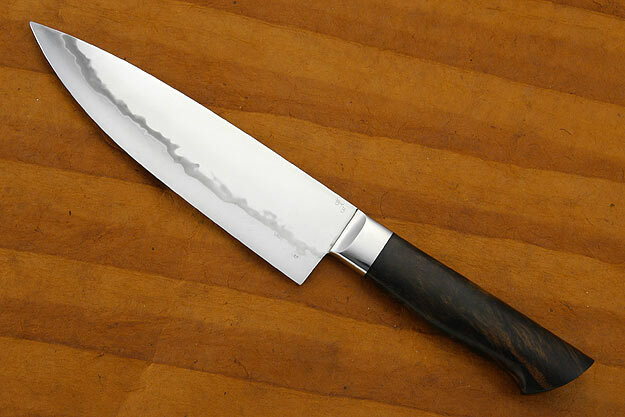 Like his hunting knives, this chef's knife was pre-tested for edge flex and cutting ability before assembly. The heat treatment followed the formulas developed by Mastersmith Ed Fowler in conjunction with Bill and has been proven to create some of the sharpest and most long lasting edges found anywhere. The handle has been formed from Western walnut wood and has nice figure. 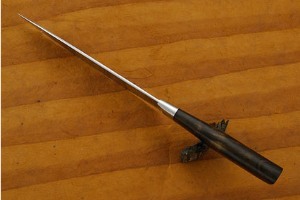 A black fiber spacer assists the handle to adjust to temperature and humidity changes. Exceptional work throughout! 0.107421875 0.029296875 107.421875 29.296875 Trailer Started. 0.21875 0.111328125 218.75 111.328125 Trailer Completed.